Ephemeral… learning more about this aspect of life everyday. I’ve learned from Piper that "God is most glorified when I am most satisfied in Him.” | Leading and learning are becoming so tightly coupled in my experience, the idea of a discipleleader seems an appropriate ideal to reach for. What motivates you to enter into a conversation about “the rest” of a person’s life? On average, how long do these conversations last? Reading a book as a leadership group is a transformative experience… it just is. 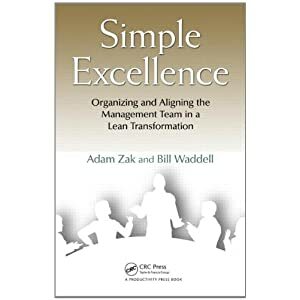 The leadership team here at Western Excelsior has been reading Simple Excellence by Zak and Waddell. Each week a different member leads the discussion around pizza or ribs as we cover the content of one or two chapters. We work hard to keep the discussion focused on the text. Its not a surprise to hear someone clear their throat and call out “What do we think about when they said, ‘___________’ here on page ____?” to politely redirect a conversation careening down a rat-trail. We didn’t agree on what success really was.